This somewhat hefty book has "Winner" subliminally imprinted on its stately, classic cover. The Introduction defines it as "the story of three men sent to tear down an empire.... This account of the campaign to liberate Europe is drawn from the words, observations, and writings of Generals Eisenhower, Bradley, and Patton, as well as those of the many aides, staffers, superiors, secretaries, stenographers, celebrities, chauffeurs, and orderlies who walked with them through their great struggle." Black and white photographs comprise a central folio; the last section includes Bibliography, Endnotes, and Indexes. The main course is a vividly rendered narrative about the interworkings, rivalries, comradeship, and personalities of the high-command triumvirate of U.S. Army Generals who engineered World War II's Allied Victory in Europe. 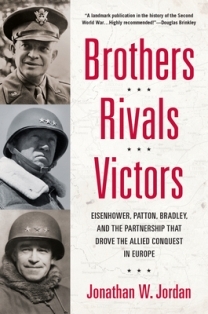 Douglas Brinkley notes on the jacket: "...Anchored by a breathtaking amount of new research, Jordan explains the strange alchemy that existed between Eisenhower, Patton, and Bradley as they struggled to defeat Nazism." All three were graduates of West Point. Supreme Commander General Dwight D. Eisenhower and Lieutenant General Omar Nelson Bradley had been football teammates there. The main event begins in December 1944 at the American headquarters in the French city of Verdun. Bradley was the senior American army group commander. "Steel-pot helmeted" Lieutenant General George S. Patton Jr., the eldest of the three, had headquarters at Nancy, as commander of Bradley's Third Army. At this meeting of the three generals, Eisenhower informed Patton that he would command the strong counterattack. The event would take place on December twenty-second, just three days away. As they were leaving the meeting to "drive a huge, roaring freight train through the front door of the Third Reich," Eisenhower said, "Funny thing, George; every time I get a new star [he'd just received his fifth], I get attacked." George Patton assured his friend and commander: "And every time you get attacked, Ike, I pull you out." Julia Oliver's literary credits are listed on her Web site www.juliaoliver.net and the "Julia Oliver, Author" Page on Facebook.